These delightful soaps are hand-crafted locally at Freaky Farms in small batches by loving hands. 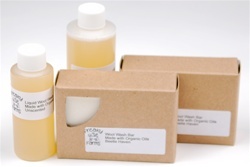 They contain only saponified organic oils and a well proportioned dollop of lanolin to keep your wool properly lanolized and in tip-top shape.Their liquid soaps are specially blended to remain emulsified. Their scented soaps' distinctive aromas are created using only organically grown essential oils. Freaky Farms, "a small outpost of sanity in West Georgia", is Annie and Jeff, a husband and wife team who are trained as mental health counselors. "As part of our life's mission to create a more sane world we decided to start with ourselves. We enjoy taking care of our goats, chickens, and garden - and of course making wonderful soaps." Use 1 tablespoon of liquid in a basin of luke warm water. That will wash more than one cover. You could use less, about a teaspoon for a single cover. Swish the liquid soap around in the water then add the cover. Not too much aggitation. Let sit/soak for about 20 minutes then gently squeeze to remove extra moisture and lay flat to dry. Remember: Rinse first for better stain removal. Don't rinse after the lanolin soak. Don't use too much agitation or water which is too hot.